In a pinch, shaving with only water will work, but you might be left with razor burn and a few nicks if you aren't careful. Most will reach for the shaving cream if they have it. Using pressurized water by itself is very similar; it's great for removing lighter dirt and mild stains; but when it's not enough, what can you do? Detergent can do wonders for removing tough stains, greases, oils, algae, and mildew. You can apply the detergent to an ordinary scrub brush and brush the area by hand. Like magic, after letting the detergent settle for a few minutes, simply spray it away with your pressure washer. However, using a type of chemical injection with your pressure washer to spray the detergent eliminates the need to scrub by hand. Instead, you'll still need to use your pressure washer without the injector to spray it clean after it settles. Many pressure washers now feature onboard detergent tanks. The detergent held in the tank is injected into the pump with the water, then the two are pressurized simultaneously before being released through the spray gun. Detergent tanks are fine for some cleaning solutions, but others should not be run through your pressure washer as they could damage it. As you may know, bleach is highly effective at killing mold and mildew. But, when you see mold or mildew growing on your siding or walkway, don't even consider running bleach through your power washer. Bleach will corrode your pump's seals and essentially render the pressure washer useless. Bleach is a dangerous chemical, and spraying bleach means propelling bleach into the air. You don't want to breathe it in, and you definitely don't want the mist blowing onto your cars or plants. Should you need to use bleach, scrub it on where needed with a brush, let it sit a few minutes, then gently rinse it away before pressure washing. For even better results, scrub the bleach away with a pressure washer brush. Onboard detergent tanks are great because they enable you to simply flip a switch and spray detergent. There are still many models available that don't feature onboard detergent tanks, which means you have to use a siphoning hose to draw detergent mix into the pressure washer from a bucket. The onboard detergent tanks are fastened to the frame of your pressure washer, enabling you to move and operate your pressure washer and detergent mixture more easily and efficiently. To operate an onboard detergent tank, you simply turn a switch on the tank to begin injecting the detergent. You then turn the switch back to the off position to stop the flow of detergent and switch back to clean water. The only downside to onboard detergent tanks is that they typically run detergent through the pump. If you're looking for a way to spray detergents or other chemicals without running them through your pump, foamers, and soap shooters are perfect. They attach to the end of your spray gun and inject the solution into the stream of already pressurized water as it's being released. 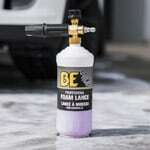 Foamers typically use lower pressure to spray the detergent onto the surface as a thicker foam. Soap shooters work very similarly but are designed for use with higher pressure to shoot the detergent over a longer distance. Foamers are available in two styles: one utilizes a spray nozzle attached to a siphoning tube to draw detergent from a bucket, and the other uses a detergent bottle attached to your spray gun so you can move more freely. The bottles get filled with whatever detergent or chemical solution you want, then you screw the head onto the bottle and attach it to your spray gun via the adapter. The valve is used to adjust the spray pattern. Soap shooters are only available as spray tips with a siphoning tube. The adjustable spray nozzle connects to the end of your spray lance, then you drop the siphoning tube into a bucket of detergent mix or other solution. Then, just like you do with the foamer, you spray away and adjust the spray pattern to your liking. These are great for cleaning siding, as you may have to reach higher spaces that require more pressure. 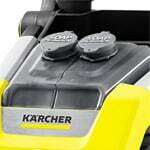 How to Pressure Wash With Soap and Chemicals.. Our Power Equipment Direct how-to library can help you learn about Proposition 65 Product Labeling, Sales Tax Information and Product Recalls for Pressure Washer Equipment.